Two charts to show you. The MP/VP chart...its messy but makes sense.....then the tick chart. I also have a daily minimized, a 120M, a 30M and a 5M stacked up on the right beside the tick chart. Those all have a single 89EMA on them. The trading chart has an 89EMA, a 34 EMA and a multi EMA with 21 being the largest one of those....Charts were out of sync today against the HTF but the 5M was in agreement with the tick chart and yesterday's VPOC and 50% level lined up and looked likely to be target areas. 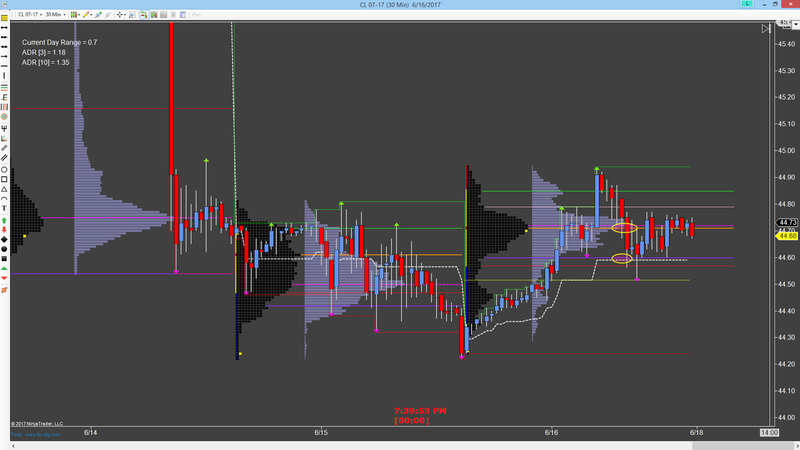 I went there twice with shorts....plus a bounce off the current day mid point and the current day Volume VAL. That trade worked as well. Yesterday and Wednesday looked pretty similar in terms of how the trades were entered and exited. Nothing fancy, just getting in on the current dominate trend and taking bites where it appears most likely to work. Interestingly enough, at least yesterday and today, Most of my trades were 2:1. I did not track it on Wednesday but I think it was more or less about the same. In that regard, I can win less than 50% of the time and still make money. Since I primarily like to risk $100 or less per contract per trade, when presented with risk of 5 ticks or less, I can trade larger size. This happened once today which was nice. So I risked $100 to make $200 once and $60 to make $100 twice. So that worked out to risking $220 to make $500. Just a bit better than a 2RR day! If I am at the charts when all the time frames align, I might be able to to find 3 or 4:1 trades without having to wait as long for them to pay of as these did today. 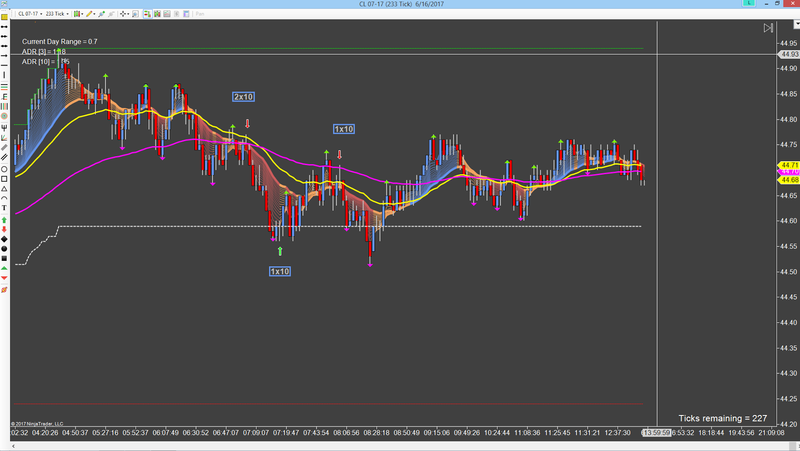 With a 5 tick risk (not going to see these all the time) and a 20 tick trade, I'm looking at 4:1 and that works for me. I can live with that. I don't know if I am going to include charts all the time when I post but I've included them here for reference. It's getting late and I'm feeling the effects of working almost around the clock this week. Tomorrow is sleep in day (til 7AM that is) some honey do's around the house, 3-4 hours of work and then perhaps a movie later in the day. On a side note, its supposed to 111 degrees tomorrow and 119 by Tuesday next week . That's 43.8 and 48.3 for those of you using Celsius! People say its not actually hell but you can see it from here! Patience is the key....or at least its in the top three things you need to be successful as a trader. The other two might the edge you have and sound money management. Beyond these three things, there is only one command in trading. That's it. Well maybe there's one more thing....Do what works FOR YOU. Ok, that's it. Ed Sekoyta said a trader should only trade as system that works with their personality. This is, in part, a portion of what it means to get yer mind right. Stop trying to work something that doesn't work for you. Insanity right? Indeed. As part of the deconstruction of my process and mental/emotional state, I've been reviewing past journals. Some really old one as well as some more recent ones. A couple of years ago, I went several months without a losing month. A few weeks ago I had my largest winning week ever. In January I didn't have losing day, a first for me. And there have been numerous other "winning streaks" along the way. They all have two things in common. 1. 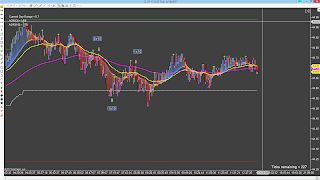 In each instance, I was scalping 10-20 ticks per trade depending on the daily ranges. 2. In each instance, I began looking for ways to further maximize the SIZE of the winning trades, whatever they were at the time. Trouble is, when I do the IF ONLYs, I don't actually do them. I say I am but I behave as though I am scalping. The net result is lots of break evens, losers and very few large winners needed to make this way of trading work. Some overcome this by scaling out of a trade but this ignores the mathematical fact that losing with an initial large position does not overcome taking smaller profits on most of the position that is a winner unless you let the last bit run a really long time. Most don't. I didn't and so this doesn't work at least for me. Assorted "experts" I've read over the years. Well Meaning Friends that have written me private messages over the years. Anonymous blog readers that send me private messages. All telling me I must have bigger wins. That scalping is a losers game. And yet, I am personally acquainted with a couple of very wealthy scalpers. Every time I do this exercise, I find people killing it by scalping. There is a disconnect here. Perhaps the non scalpers are telling me the truth....at least from their perspective and the scalpers are also telling me the truth......from their perspective. I have a theory about the universe. That when truth presents itself, something inside a person will resonate with that truth. Whatever the truth that person needs to hear for themselves will leap within their spirit. And somehow scalping has resonated with me. Its time I acknowledged this publicly. There is a book out now that is quite popular. The author even has a Ted Talk. The book is called "The Magic of not giving a f**k!. I haven't read the book nor listened to the Ted Talk. The title looks like click bait to me but there is a truth contained within the click bait. That is, those that are successful in any endeavor have really one thing in common. They don't care what other people think about them in their pursuit of their goals. I have spent a long time as a trader giving a f**k about what other traders thought about me. I knew I needed to have big wins to impress people and truth is, this is a limiting belief. As John D. Spooner once said, "Do you want to make money or do you want to fool around?" I've been fooling around it appears trying to impress everyone except my bank account. On Wednesday, I went back to scalping. I made 50 ticks, yesterday, I made 30 ticks, today I made 30 ticks. No trade was larger than 10 ticks. Granted I could have sold on Wednesday and just held and made a ton of money but that goes right back to the issue I discussed earlier. Greed. I made more in the last three days than I did in the 30 days prior. I will be a scalper from now on. It fits my personality like a glove. There is a source of pride and ego in being able to say I made a 6R trade or made a 100 tick trade but I would rather make $100-$200 per contract day in and day out than try to hit home runs every day. Onward and upward as they say.